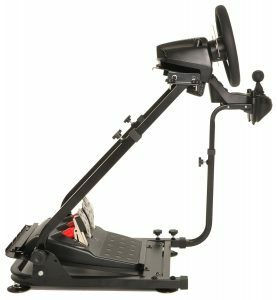 Conquer Racing Simulator Steering Wheel Stand is a high-performance racing cockpit that is designed for enhancing the experience of those that are very serious about their gaming. It works with a variety of systems including Xbox 360, PS3, PS4, Logitech, Thrustmaster and Xbox One. Conquer Wheel Stand is a fairly new product without many online reviews yet and is rated 4.1 out of 5 stars out of four product reviews at the moment. It includes a gear shifter mount and can be mounted on the right or the left side of the unit, whatever suits you the best. And the different wheel positions, gear shift, and pedals are easily adjustable. It requires very little assembly- is very easy to assemble with just a few screws to attach and knobs to adjust. One of the customers pointed out that there is not much in terms of instructions included and that you will need your own screws. Please note that you won’t get the racing wheel and the controls in the box. 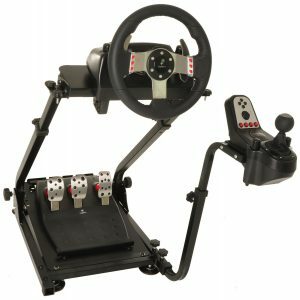 You will be able to place your accessories in a realistic racing position with this steering wheel stand, as it can be easily used with the different main pedal, gear and wheel set-ups. It has a sturdy steel construction and is designed to last for a long time. It has a slim profile and you can easily fold and store it under a desk or somewhere convenient when not in use, until your next session. Conquer Wheel Stand weighs 55 pounds and measures 54 x 22 x 35 inches, so it may be a good idea to measure your available space in your room. You can adjust the height between 21.5 and 28.25 inches and the shifter between 17.5 and 23 inches. And you may also want to check this with the height of the chair you use at home. In the box, you will find the two brackets for the pedal plate and you can lock the pedals in place easily. For the Thrust Master steering wheels, you need another harness that is not included in the box. After the proper assembly, it is reported to feel very stable and will offer a good platform for serious gamers at a reasonably affordable price. It will definitely improve your gaming and racing experience lots. It is a very good and stable product overall at the lower price point and we don’t hesitate to recommend it.